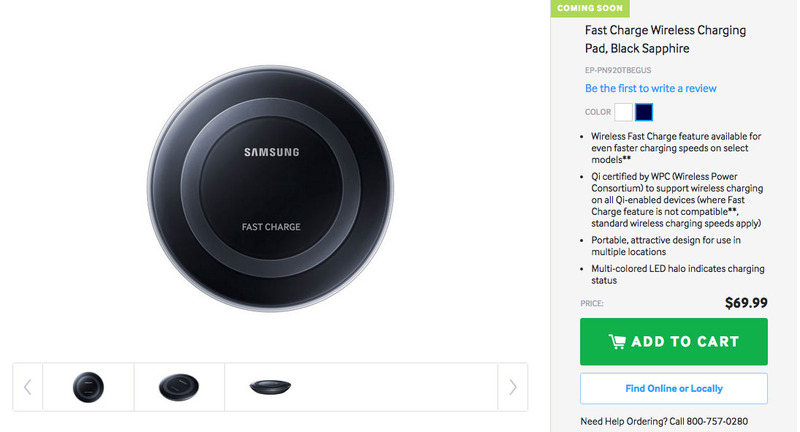 Samsung’s new fast wireless charger that was introduced alongside the Galaxy Note 5 and Galaxy S6 Edge+ will cost $69.99, according to Samsung’s online store. The chargers aren’t yet available and are listed as “coming soon,” but they will be available in either black or white once the company has them in stock. That price is kind of insanely expensive for a wireless charger, but I can’t say that I’m shocked to see it given that this is the first time we are seeing fast wireless charging in a phone and charger. Still, when you can head over to Amazon and buy a fully capable Qi wireless charger for $20, you have to wonder if the tech behind this fast charging is really worth over 3x the price. Any takers? I’m certainly interested. Fast charging has been one of my favorite tech introductions in recent years, so it seems only logical that I consider making the move to fast wireless charging. Then again, I would need to make the Note 5 or S6 Edge+ my daily phone. Choices are tough…and expensive.